Nigeria as a "fantastically corrupt country". However, it should be noted that Cameron was actually making reference to the ruling class in Nigeria and not the hapless ordinary citizens of the country, who are indeed bearing the brunt of the bad governance, exploitation and corrupt practices of their bourgeoisie since 1960. Notwithstanding that Nigeria has been ravaged and ravished by unconscionable capitalists since she gained independence over fifty eight years ago, official corruption in the country apparently became uncontrollable for the sixteen years the Peoples Democratic Party, PDP governed between 1999 and 2015. This was in spite of the establishment by former President Olusegun Obasanjo, of anti graft agencies such as the Economic and Financial Crimes Commission, EFCC, the Independent Corrupt Practices Commission, ICPC and Due Process Office in the Presidency. As a matter of fact, the PDP governments of late President Umaru Yar'Adua and former President Goodluck Jonathan which came after the Obasanjo regime were overwhelmed by corruption. Hence, the Jonathan administration shamelessly shared money meant for acquisition of weapons to fight the Boko Haram insurgency, amongst political acolytes ahead of the 2015 general elections. Virtually all beneficiaries of the fantastically corrupt Jonathan government are today in the vanguard of support for the PDP presidential standard bearer, former Vice President Atiku Abubakar who wants to take over from President Mohammedu Buhari of the All Progressives Congress. Certainly, Atiku would not have moral authority to prosecute them if (God forbid) he wins the forthcoming elections. The former Vice President has severally been accused of being fantastically corrupt even by his principal, former President Obasanjo, who ironically is presently supporting his presidential ambition. The controversy surrounding the inability of the PDP presidential standard candidate to visit the world's most powerful country, United States of America, because of alleged shady deals involving him, his fourth wife, Jennifer and Congressman Jefferson has tended to lend credence to the suggestion that Atiku is not a clean man. Jefferson was jailed by the US government for the malfeasance. Notwithstanding that one of the major planks of President Buhari's policy thrust is the fight against corruption, the seeming selective prosecution of the war by his administration has cast a very serious slur on the ordinarily noble objective of the exercise. For instance, the grass cutting contract scandal involving a bosom friend of the president and erstwhile Secretary to the Government of the Federation, SGF, Babachir Lawal, appears being treated with kids gloves. Investigations into the notorious Abdulmuminu Maina Pension Funds multi billion naira scandal seem not to being pursued with vigor by the Buhari administration. Recently, the President's wife, Aisha alleged that a cabal made up of about two persons are actually running the affairs of Nigeria contrary to general belief that her husband is in charge of the Aso Rock Villa. An estranged friend of the president, Alhaji Buba Galadima, who has defected to APC, has equally alleged that certain relatives of the President, hitherto known to be persons of straw are presently swimming in an ocean of wealth under the Buhari presidency. There is no denying the fact that corruption is perhaps the worst bane of Nigeria. It is doubtlessly the main reason why our country is grossly underdeveloped almost six decades after her independence from the United Kingdom. In the face of these allegations, counter allegations and suspicions which somehow contain some elements of truth, the onus is on the Nigerian electorate to decide whether they truly want a paradigm shift or not. 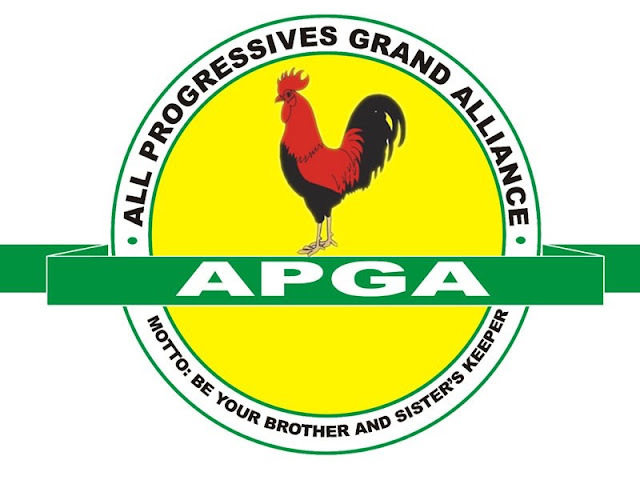 The best alternative to the obvious scourges known as the PDP and APC, is the All Progressives Grand Alliance, APGA, which has clearly acquitted itself creditably in Anambra state in the past twelve years and nine months. Within this period Anambra is the safest and most investment friendly environment in the country. Her human development index and gross domestic product, GDP are the best in Nigeria. The states education system is evidently unequalled, henc her students have consistently been winning global academic and tecnovision laurels in Singapore and Silicon Valley in the United States of America etc.